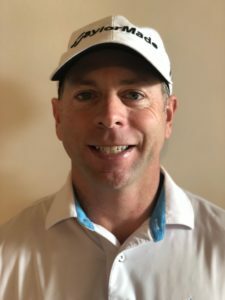 Chris Krueger should be proud of his too-short tenure as the head coach of the Cape Henlopen High School golf team. Krueger, 45, told Cape Athletic Director Bob Cilento school last fall that he would not be able to return for the 2019 season. 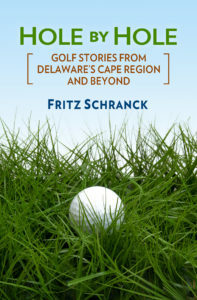 The former Delaware Open and Delaware Amateur winner is the director of instruction at Kings Creek Country Club. He’s also the father of two youngsters, Cam age 3, and Seth age 2. With those growing responsibilities, it is not too surprising that Krueger had to call a halt to his coaching stint. “I just can’t find the time right now,” he said. The Vikings did well the last two seasons. In 2017, Krueger’s first year, the team finished in ninth place in the state championship, a single stroke behind two teams that tied for seventh. Last year Cape finished in seventh place in the state finals. It was one of three public schools to complete the tournament as a team, and the sole representative from Sussex County. Dye is perhaps best known for her suggestion about what to do with a large hole created by mining sand at what we now know as TPC Sawgrass. She argued for an island green, and the 17thhole that resulted is one of the most famous par 3s in the world. From my perspective, however, her greatest influence in golf came from her persistent efforts to promote the proper placement of tee boxes. In years past, the “women’s tees” were placed at the front edge of the “regular” tee box. As she noted in her 2004 autobiography, “From Birdies to Bunkers,” this often meant that women golfers were expected to compete at 6,200 yards or more. That worked, mostly, but only because the courses would dry out during the season. Once golf course operators began to “drench fairways” with new irrigation systems, as she put it, women golfers struggled to deal with the long yardages. Dye presented her Two Tee system for women at a joint meeting of the men’s and women’s handicap committees of the United States Golf Association. She suggested that competitive tee box set ups for women should range from 4,800 to 5,200 yards. That’s how I reacted to the enthusiastic presentation of Jordan Black and Collin Iacarella at the No Sweat Company booth at the 2019 PGA Merchandise Show in Orlando, FL. Black and Iacarella told me the liners were first used for ice hockey helmets, and are now common throughout most hockey leagues. Since then the company expanded its designs to accommodate hard hats and now baseball-style caps and visors. In addition keeping sweat from rolling down one’s nose from above, there are other benefits. 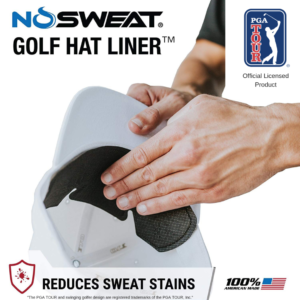 Most golf caps are easily discolored by sweat, and the dishwasher cleaning option is usually less than an optimal solution.